Last week I visited the Joseph Cornell exhibit at the Peabody Essex Museum in Salem and the following day went to see the Edward Hopper exhibition at the Museum of Fine Arts in Boston. Seeing the two exhibitions one after another presented interesting contrasts both in the work of the artists and the presentations of the work. With my new interest in using recycled materials in bookmaking (mostly in relation to my teaching) I found the Joseph Cornell exhibit of particular interest. I view exhibits which have clues to me as an artist differently from the way I view art as an observer and an appreciator. I felt more of the former with Joseph Cornell and the latter with Hopper. My first impression on entering Joseph Cornell: Navigating the Imagination was where are the lights? To protect the work, the lights in the exhibition were dim. My first feeling was, this is rather restful. After trying to view some of the work closely, I began to feel annoyed. Glasses on, glasses off. Finally my eyes began to adjust and the lighting was no longer an issue. Several people I have spoken to about the exhibit commented that some of the pieces were weaker than others. One friend much preferred a smaller show of his boxes she saw in New York. The more time I spent in the exhibit, the more I liked it. I liked the fact that it was not just a presentation of his best works but a view inside his mind. One of my favorite parts of the exhibit was a passageway between galleries that had huge photos of his house in Queens (on Utopia Parkway- what a perfect name) and his studio and a collection of objects from his studio. Seeing the stages of his work, from the collecting to the sorting and storing to the assembling, gave me a deeper insight into his process. Since I am not a painter and my subject matter is very different from his, I came to the Edward Hopper exhibit more as an appreciator. It found it interesting to see an image as familiar as Nighthawks in its original form. Seeing the difference in scale, being in the presence of the real painting with all his visually tactile qualities made me turn off the little cataloguer and categorizer of images in my brain. Not I've already seen that, I know what this is, but here is a painting to be looked at afresh. I think that this is one of the things that we can gain from the art viewing experience. In addition to the effect of being in the presence of something of depth and beauty, seeing the world through the eyes of an artist who has taken the raw material of life and transformed it sends us back out into the world with our eyes more open. 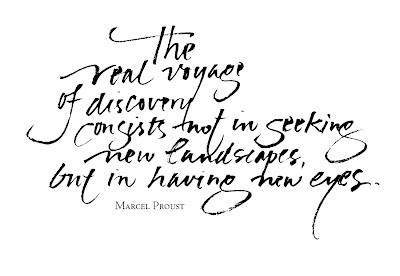 Our lives are enriched not just by seeing the art but by the way it allows us to see the world anew. Both exhibits close on August 19. I don't mean this in a bad way, of course! Ethical concerns aside... I just hope that as technology further advances, the possibility of copying our memories onto a digital medium becomes a true reality. It's a fantasy that I daydream about all the time.